As a first gigging kit it sounds big and will suit any style. The Horizon HX package offers a lot for the money and its looks belie its budget status. Brushed wrap, classy silver badge, stylish new ITS mounts, contoured memory locks and new small lugs - this is a tasty-looking kit. Everything you need to get drumming is included. There are budgetary savings in the metal bass drum hoops and basswood shells, although these are outweighed by the upmarket extras. Launched at the beginning of this year, alongside the entry level Voyager, the Horizon is the latest Mapex budget drum kit and represents an extensive makeover. There are two options - the Horizon HX Wrap (replacing the QR after four years) which comes with a 'free' cymbal pack; and the Horizon HZB Lacquer (replacing the VXB after two years), with an extra 'free' 8"x7" or 10"x8" tom. 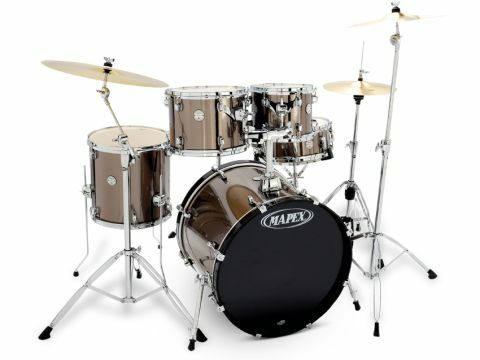 Reviewed here is the cheaper HX which has three set-up configurations, each with a complete 500 series hardware set and cymbals. The review kit is the middle of three size configurations with 22"x18" bass drum, 10"x8" and 12"x9" hanging toms, 14"x14" floor tom and matching wood 14"x5.5" snare. Alternatives are the Rock setup with larger toms and Fusion kit with 20"x18" bass drum and smaller toms. The Horizon HX has 7.2mm, eight-ply shells made from basswood. The HZB (not reviewed) has a more expensive birch-basswood hybrid shell - the outer ply of birch allowing Mapex to finish the shells in a choice of four lacquer finishes. Basswood is a pleasant white wood with open leafy grain and, interestingly, Mapex has laid up the inner ply vertically rather than horizontally This makes the bearing edges harder to cut, but aids the passage of sound waves up and down the shell (although we'd be surprised if there's anyone anywhere who can hear a difference). Inside, the shells are smoothly finished with the angled joins immaculate. However, the budget nature of the timber shows in the end-plies which are a bit coarse and the 45 degree bearing edges, which are fairly well cut, though there are slight rough spots here and there. We really liked the Grey Steel wrap of the review kit, which is firmly stuck down and looks sharp, especially in tandem with the rather splendid, round silver badge. Newly re-designed lightweight lugs are set on rubber gaskets and attached to the shell using single bolts for minimum intrusion. There's a telescopic bass drum mount for the two small toms. You can stick an extra cymbal arm into the central post of the mount, which is handy. As for the toms, they are attached via two ball-and-socket, hexagonal cross section 'L' arms which slot into receiver blocks bolted to the newly revamped ITS (Isolated Tom Holder System) brackets. These brackets are 'V' shaped steel plates which are fastened beneath two adjacent lugs, isolated from the shell by rubber gaskets again. The 'L' arms have enclosed memory locks which snuggle tightly into the receiving block. All-in-all a neat solution which feels solid and stable. One budgetary saving is made on the bass drum hoops which are metal, not wood. You don't see that many steel hoops these days, but they do have the advantage of strength. The bass drum claws are also a new design and have thick rubber isolating gaskets which help subdue any ring from the hoops. The kit comes with a full set of newly designed 500 series hardware which benefits from several features filtered down from the 700 series, such as newly-styled memory lock clamps and ergonomically contoured wing nuts. And there are Multi-Sustain cymbal felts on both cymbal stands and hi-hat clutch. You also get a snare stand plus both straight and boom arm cymbal stands. The chain drive bass pedal has a beater with interchangeable felt-plastic head, while the hi-hat has a large tension adjuster. And we're glad to see Mapex has included a padded throne. This is important, as being able to adjust your sitting height and obtain a relaxed posture is vital from the beginning. On top of all this is a basic set of brass cymbals - a 20" ride, 16" crash and pair of 14" hi-hats. Basswood shells are cheaper substitutes for maple and, with the now familiar, made-in- China Remo UX single-ply heads, they easily produce a warm and resonant maple-like tone. Still, by comparison with a pro kit the toms suffer a small loss of quality and clarity. This is partly due to the bearing edges being less than perfect, which also makes it harder to tune. There were some fruity overtones on the toms and this is why so many budget kits in schools and bedrooms get plastered in tape. But a word to new drummers and schools - don't be scared of ringing toms, they mostly don't need much damping. Honestly, they're meant to RING! There's a full (uncut) front black bass drum logo head while the batter has a perimeter damping ring. You will still likely want to use some damping, eg: a small pillow pushed lightly against the batter head bottom. With this in place the lows are accentuated and you get a really impressive, reverberant thud. The snare was lively - lightweight with just eight lugs and this tends to result in a loose, crunchy-sounding drum, which can be a little wild. Tuned high it can get boxy, tuned low it can rattle. Again, try to avoid plastering it in tape (unless going for a specific effect). Half a perimeter 'O' ring or some Moongel is a cleaner, more versatile solution and will give you a crisp and tight snap. Next there is the matter of the cymbals included in the package. Although nominally 'free' and despite their inevitable lack of sustain they have a not-unpleasant tone. Truthfully, they're not half bad. The 20" ride is clean and deep with a warm, soft bell. The 16" crash has a shriller pitch and is predictably short on body and sustain. The hi-hats are also rather weak, but produce an agreeable sound. Overall, this set is plenty good enough to get you started. The hardware package is more than generous for a kit at this price level. It's double braced but not too heavy. The cymbal stands and hi-hat clutch have Mapex's special Multi-Sustain felts which have paired threaded rubber discs as well as standard felts. This allows you to mount the cymbal quite loosely (so it's not stifled) but still feel secure. Or you can mix felt and rubber in various combinations to give slightly different sustain patterns. Good idea, this.